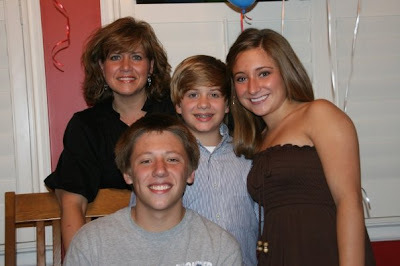 With great anticipation, we waited all day Saturday, the 19th, to wish Zach a happy birthday. Chandler and I (mostly Chandler) planned a surprise party for him. Seconds after the "SURPRISE!! ", I asked him if he was really surprised. Zach replied, "No.... I knew." He's not a straight A student on accident. But we all had fun. He passed his drivers test on the following Tuesday and was able to drive himself to his soccer practice that evening. It was the first time he'd driven alone. We all tried to act cool about it, like he'd been driving for years. But after he walked out the door, Chase and I raced to the window to watch him get in the car, fix mirrors, and pull out the driveway. He caught us at the last second and gave us a smile and a wave. Tuesday was big day for Zach. Getting his license. Driving.... his daddy's car. The day had it's joyful and exciting moments. But at the end of the day, Zach crawled into his daddy's spot in our bed and had a good cry. That just says it all, doesn't it?? That is a true picture of grief. Life goes go, but never without the pain. Last weekend, the kids and I were able to attend the Miss State/LSU game in Starkville. The kids hadn't been to a football game in so long their memories were vague. Chandler's friend, Ashleigh, went with us. My cousins were generous and shared tickets with us. Seeing them "take it all in" was really fun for me. The cowbells were ringing and the fans were chanting "maroon" and "white". The game was so exciting! The whole weekend, the scrolling thought constantly rolling through my mind was how proud Frank would be of me! He was the football guy. Yet, I packed up 4 kids and drove to Starkville. Saturday morning the sky poured down the rain. But that didn't stop me! I was boy scout prepared. I bought rain ponchos, got parked in time for us to enjoy breakfast on campus, walk around the Union and had us in our seats on time! Just like last Tuesday, we had a great time - cheered, laughed and took it all in.... all with the overwhelming sense of loss that Frank was missing it all. Maybe he wasn't. Ashleigh told us he just had a better view. It was us missing him. Yes, indeed. Heavens, raise the roof! Earth, wake the dead! Mountains, send up cheers!God has comforted his people. He has tenderly nursed his beaten-up, beaten-down people. It's been 5 months. Our schedule is almost identical to the way it was a few years ago. The kids are in school, I'm working at Hope. The familiar routine has been comforting, but it has also caused - for me - a strange sense of denial. Things are so much like they were before, that the anticipation of Frank walking through the door after work is worse now than it was a few months ago. I keep looking for my daily text he always sent when he left the office: "ETA 20 minutes". I am looking for him at our Wednesday night dinners at church. With Zach driving his car now, when I see it gone from the driveway, my mind tricks me and I think Frank is just not home. I talked with my grief counselor about this. She said it just takes time for our heart to catch up with our head. We know our loved one is not coming back, but our hearts wants it to not be true. All of this is normal to the grieving process. And in spite of all our emotions, I am pleased with our progress. I am so proud of how the kids seem to be handling everything. We still have long way to go, but we are moving ahead the best we can. I am excited about being hired by The Shot Nurse. I will be helping them with the H1N1 vaccine through flu season and I start Monday morning. "Give your entire attention to what God is doing right now, and don't get worked up about what may or may not happen tomorrow. God will help you deal with whatever hard things come up when the time comes. September 11th is Frank's birthday. Of course, it's the attacks on our nation that most people think of when you say 9-11. 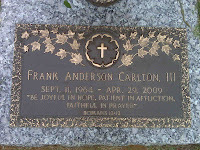 When Frank would sign in at the doctor's office, the receptionist would ask for his name.... "Frank Carlton".... and then date of birth.... "9-11-64". Almost every time, they would look up at him (sometimes for the first time) with big round eyes, as it he had something to do with the attacks somehow. Frank would just smile with that precious twinkle in his eye and say... "It was my day first". Well, it was his day first. Today marks another "first" in our journey. It reminds me of conversations Frank and I had about his leaving us. He would say them in light hearted way, but I knew there was truth to his feelings. He once said he didn't want to die around any one's birthday or holiday and he wanted his funeral to be on the weekend. He said he didn't want people to have to take time off work because of him. Well, he sort of hit the mark on both of those. Chandler, Jim and Momma have April birthdays, but they are before the 29th. And, we did have a weekend funeral. It made me happy to know it worked out that way for him.......... it's the little things, you know? Frank and I learned how to make gumbo a few weeks after we were married. I'll never forget talking with his Mimi in Greenville as she instructed us over the phone how to make the roux and share her tips with us. What a sweet memory that is. She had a giggle a lot like Frank's. We have made gumbo every year since then as our special tradition - usually on New Years Eve. We decided to move Gumbo night to September. We will mark the tradition tonight on Frank's birthday, and then it will probably be Zach's birthday dinner in years to come. He loved sharing a birthday party with his dad. This birthday for him will be especially difficult. We stayed up late last night making the gumbo. We listened to Frank's voice in different recordings we'd saved. And we cried together as a family as we remembered him on his birthday. The marker has been placed - as the pictures show. 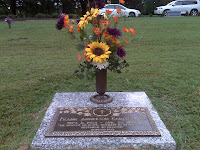 We are pleased with it and think it honors him as he would have liked. I put flowers in his vase from our garden all summer long and will miss the chance to take them out each week. They were flowers that all came up from seed that he had planted the year before. Thank you for your continued prayer for us. We need it still as we travel through this first year. We are hurting still, but more importantly, we are healing too. We know it takes time and we are continuing to praise our wonderful Savior for all He as done... and will do! His grace, mercy and provision for us is so evident. How can we be anything less than in awe of Him?? One of the things we did last night, as we stirred the gumbo pot, was read the Sept 10th entry from "Streams in the Desert", by L.B. Cowman. I know this is a bit long, but it was so powerful to each one us and so timely... just another little gift from God right when we needed it. I hope it blesses you as much as it did all of us. There is a divine mystery in suffering, one that has a strange and supernatural power and has never been completely understood by human reason. No one has ever developed a deep level of spirituality or holiness without experiencing a great deal of suffering. When a person who suffers reaches a point where he can be calm and carefree, inwardly smiling at his own suffering, and no longer asking God to be delivered from it, then the suffering has accomplished its blessed ministry, perseverance has "finished its work" (James 1:4), and the pain of the Crucifixion has begun to weave itself into a crown. At this point, the person stops imagining castles in the sky, and pursuing foolish ideas, and his reasoning becomes calm and relaxed, with all choices removed, because the only choice has now become the purpose of God. Also, his emotions are weaned away from other people and things, becoming deadened so that nothing can hurt, offend, hinder, or get in the way. He can now let the circumstances be what they may, and continue to seek only God and His will, with the calm assurance that He is causing everything in the universe, whether good or bad, past or present, to work "for the good of those who love Him" (Rom 8:28). The main thing is to suffer without becoming discouraged.